Christopher Abbey used a drone to record an epic trip to Mt. Whitney in California. It's part of the Sierra Nevada chain of mountains which run down a portion of eastern part of the Golden State. With a peak elevation of 4.5k meters (around 14.4k ft.), Mt. 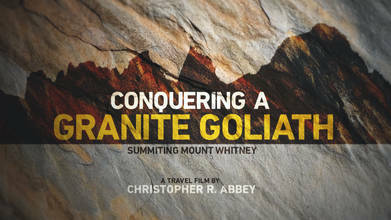 Whitney is the tallest mountain in the chain, in the state of California, and in the continental United States. The perfectly shaped peak was first scaled in 1873, following a series of failed attempts. Its eastern face wasn't conquered until 1931.